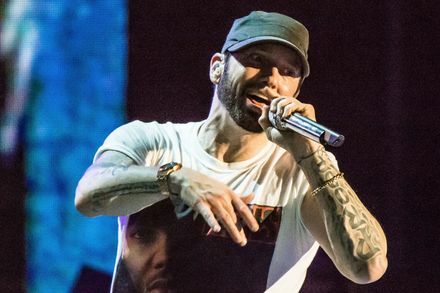 Eminem’s New Album “Kamikaze,” set to break world records. The following album is rated explicit and meant for audiences 17 and older. The known rapper, Eminem, real name Marshall Mathers, recently dropped the new album Kamikaze on August 31, 2018. This is the 10th album that the rapper has released over his rap career and is projected to be one of his highest selling albums. Produced by none other than the lifelong friend of Eminem, Dr. Dre, and Eminem himself, this album has 13 songs with guest appearances from other artists such as Joyner Lucas and Royce Da 5’9. This album is special for one main reason: it went #1 in 70 different countries in under 24 hours. Impressive by itself, this happened without him promoting the album one time. With its debut, it already had sold 360,000 units on release. The album has generated some controversy for use of slurs and diss tracks but has received generally favorable reviews and solid sales numbers. The most interesting part about this album is it includes lyrics from other popular songs. On the song, “Greatest,” of the Kamikaze album, it includes parts from “Humble” by Kendrick Lamar and parts from “Woke Up Like This” by Playboi Carti and Lil Uzi Vert. Of course, he asked permission as the artists of these songs are put as writers when looking at the album description. Overall, this album is set to break records, give it a listen and you might find out why.